Lungs Diagram – Lungs Chart – Diagram of the lungs depicts various parts of this vital human organ responsible for breathing and oxygen intake. 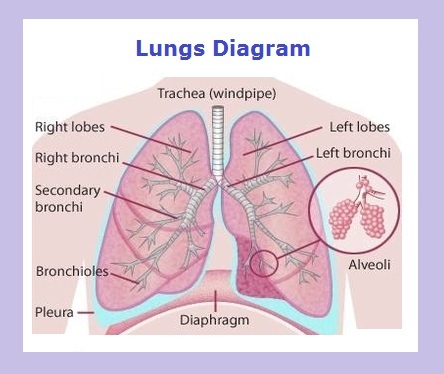 Lungs diagram below displays human lungs anatomy consisting of bronchi, lobes, alveoli, diaphragm, bronchioles, pleura, trachea. Human lungs explained.